India Napier presenting her poster at the conference. 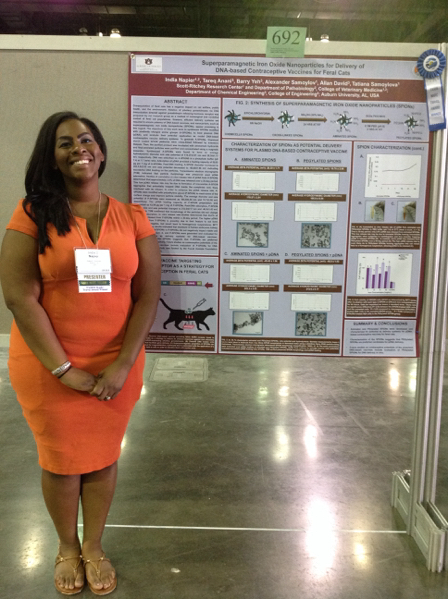 College of Veterinary Medicine doctoral candidate India Napier recently presented a poster on her research project at the international meeting of the Society for the Study of Reproduction (SSR) in Puerto Rico. Napier’s presentation, titled “Superparamagnetic Iron Oxide Nanoparticles for Delivery of DNA-based Contraceptive Vaccines for Feral Cats,” dealt with a portion of Napier’s research in developing and delivering contraceptives to feral cats. “Feral cats have become a chief concern as a health risk for people, and they’re responsible for the continued deaths of several birds on the endangered species list,” said Napier, a native of Boston, Mass. Napier’s research aims to control the population of feral cats and help stem the spread of the disease. Napier completed her undergraduate degree in biology from Boston University and her Master’s degree in biomedical sciences from Auburn in 2011. She expects to receive the Ph.D. in May, 2016. The SSR meeting brings together researchers and students in the field of reproduction to discuss ideas, learn new information, and network with like-minded professionals. Napier has attended the past four conferences, and said that it’s a great experience every year. Dr. Frank “Skip” Bartol, the associate dean for Research and Graduate Studies at the college, stressed that one of the most important benefits of the SSR meeting is the chance to network with and look for people to collaborate with, both for research and employment. Napier was quick to give credit to Dr. Tatiana Samoylova, a research professor at the Scott-Ritchey Research Center who directs the lab where Napier conducts her research, and Dr. Bartol for guiding and mentoring her throughout her time at Auburn. 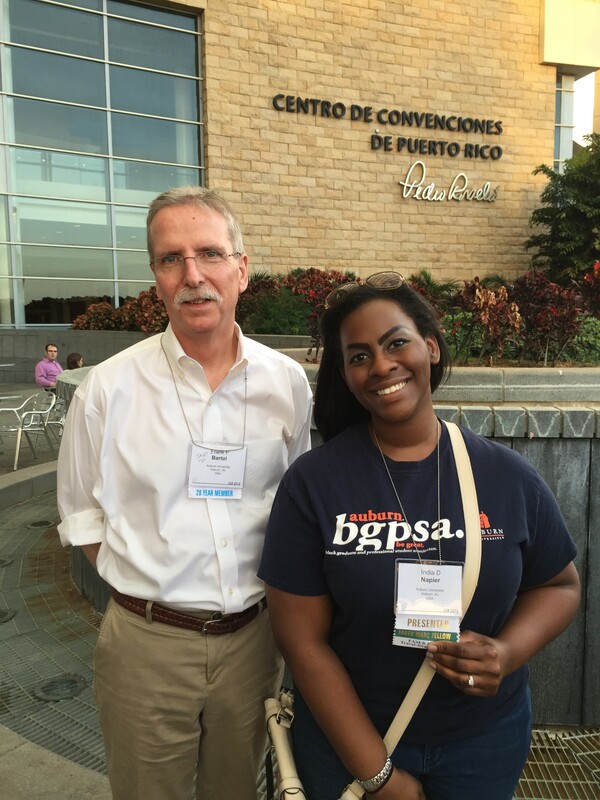 Napier and Dr. Frank “Skip” Bartol outside of the Puerto Rico Convention Center where the meeting was held. Dr. Bartol traveled separately from Napier, but also attended the meeting. “India is someone who asks good questions and trusts in herself to come to the best conclusion based on the feedback of others and her own experiences,” Dr. Bartol said. “She’s worked very hard to get where she is, and most importantly, she’s worked for herself, to meet her own standards of excellence, rather than to please anyone else. Napier received a travel award to assist with the expenses for the trip from the Federation of American Societies for Experimental Biology through theorganization’s Maximizing Access to Research Careers program and has for each year she has attended.